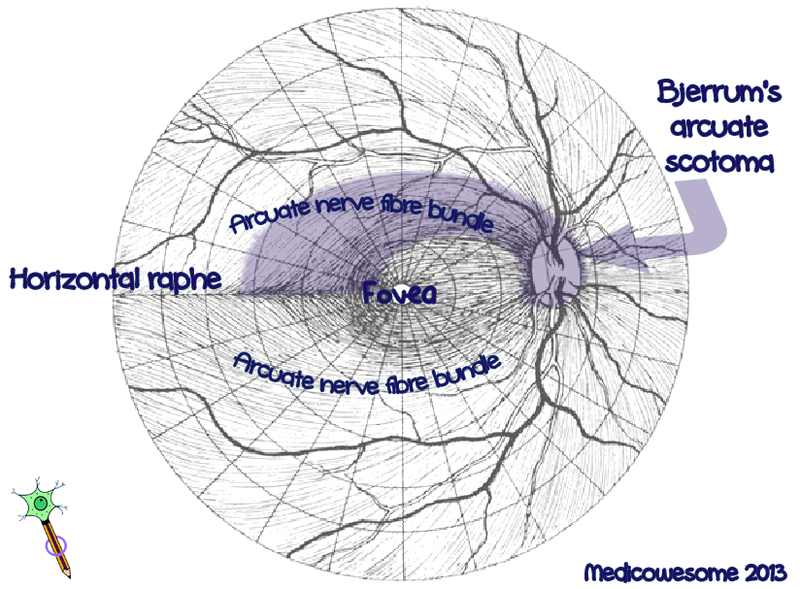 Part of the visual field corresponding to the fovea centralis. Portion of the visual field within 30° of fixation. What is Bjerrum’s area (arcuate area)? That portion of the central field extending from the blind spot and arching above or below fixation in a broadening path to end at the horizontal raphe nasal to fixation. 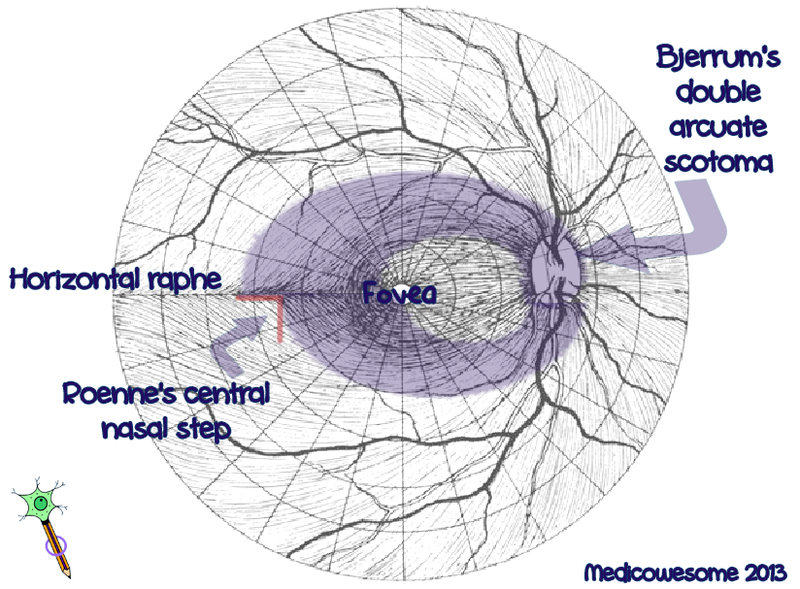 Bjerrum’s area usually is considered to be within the central 25° of visual field. Visual field defects are initially observed in Bjerrums area & correlate with optic disc changes. Isopter Contraction (IC): Mild & generalized constriction of central & peripheral field. 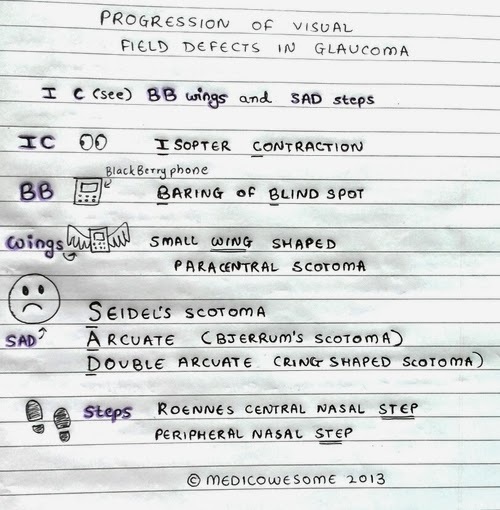 Baring of Blind spot (BB): Exclusion of blind spot from the field. Double arcuate or ring shaped scotoma (D): It develops when two arcuate scotomas join. You need to treat the glaucoma or else the visual field loss will spread & eventually a small island of central tubular vision & a temporal island (more resistant to damage) will be all that is left. Asked through email: Hey IkaN! What does exclusion of blind spot mean? Answer: Exclusion of blind spot means the blind spot is not included in the area of vision loss. The pie is your field of vision, cherry is the blind spot and if you eat the pie, you can no longer see it, hence the eaten part is the area where there is vision loss. I'm such a foodie lol. Thats an awesome presentation... got a clear view.. thanks.. I am glad i found your blog! Thanks a ton! This was mother of god! Now I'll stay in touch with your blog! Super cool! I'll write the post next month, caught up with exams at the moment. In super short, Kaplan videos, Goljan audio, uWorld qbank & first aid is the general way to go for step 1. Umm you mean scholarships for electives? It depends on the field you are applying for and the colleges you opt. The process is costly, but I think you should prepare for the exam anyway. The knowledge you gain is immense. And my belief is that, if you have the will, God finds a way for you. So don't let finances stop you from studying! But that's just me. What text do u use to study ophthal ?khurana ? I think that was the book! Why? 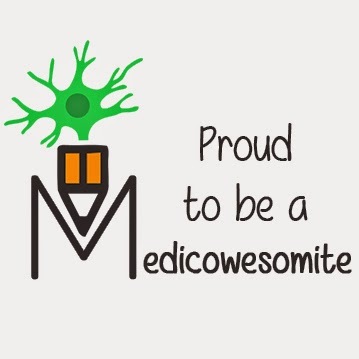 Blog posts help a lot esp when exams are near... thank you sis for such an awesome glaucomatous post!! !